What is the 'deal sheet' in transfers? Clubs sometimes conclude deals at the last minute and it is not always easy for them to get everything completed and sent over by the deadline. 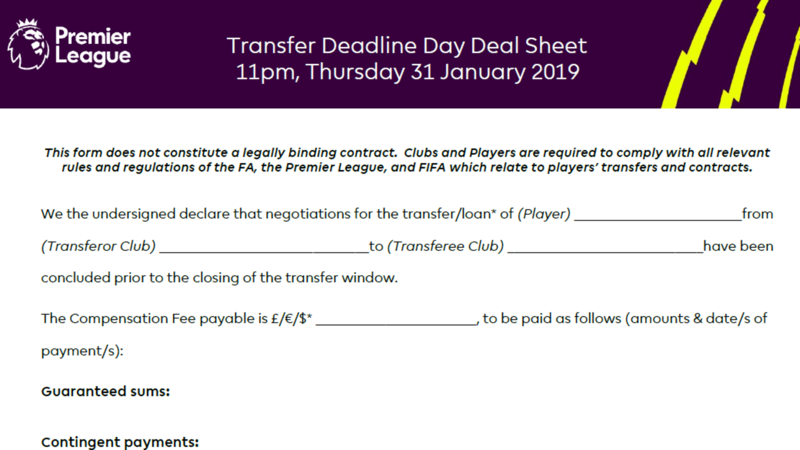 The deal sheet allows a club to confirm that a deal has been reached in order to allow for additional time to submit the remaining documentation. For a deadline of 23:00, the deal sheet cannot be used before 21:00 and needs to arrive fully completed before the transfer window closes. Once the sheet arrives, clubs have got until 01:00 in which to submit the full paperwork. But if a club are looking to complete an international transfer, they still have to comply with the FIFA Transfer Matching System (TMS) deadline of midnight. Part 5:How does the work-permit process work for transfers?